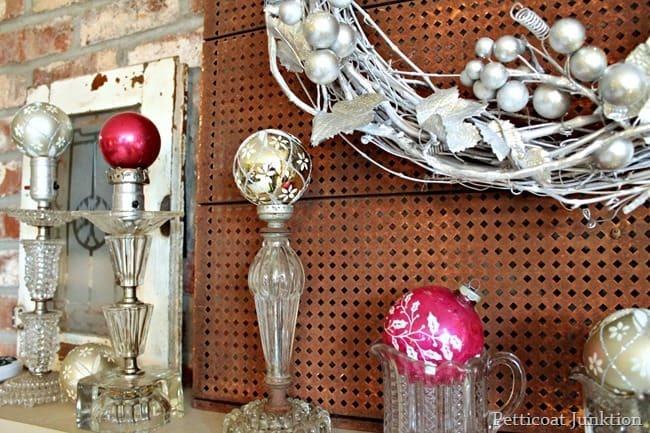 Sharing my best Christmas decorating ideas using recycled items today. You guys know how I find the best junk and then I use it as is or change it up to use in our home. Our house is filled to the brim with my junky finds. You can get a lot of bang for your buck by buying items at flea markets and junks shops that can be used year round in all kinds of decor. You don’t necessarily need to buy anything. 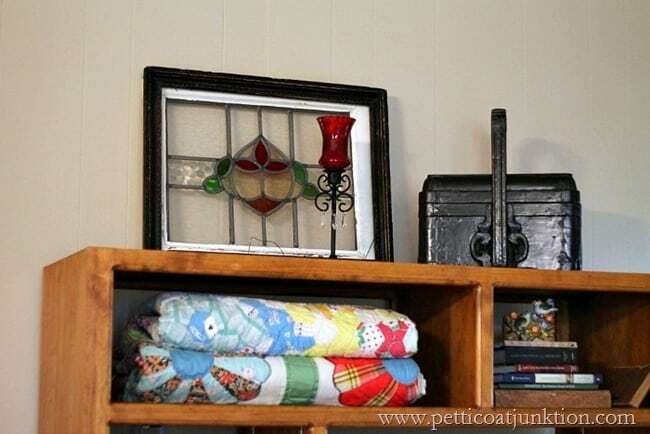 Repurposing or displaying in a unique way what you already have adds charm and character to the humdrum. Take a look at my Christmas mantel and hearth decorations from a few years ago. Aren’t those vintage thermoses fun. I didn’t do anything to them just selected them to add to my display because of the red cup cap. The red container the gold glitter deer is standing on goes with the vintage thermos set. 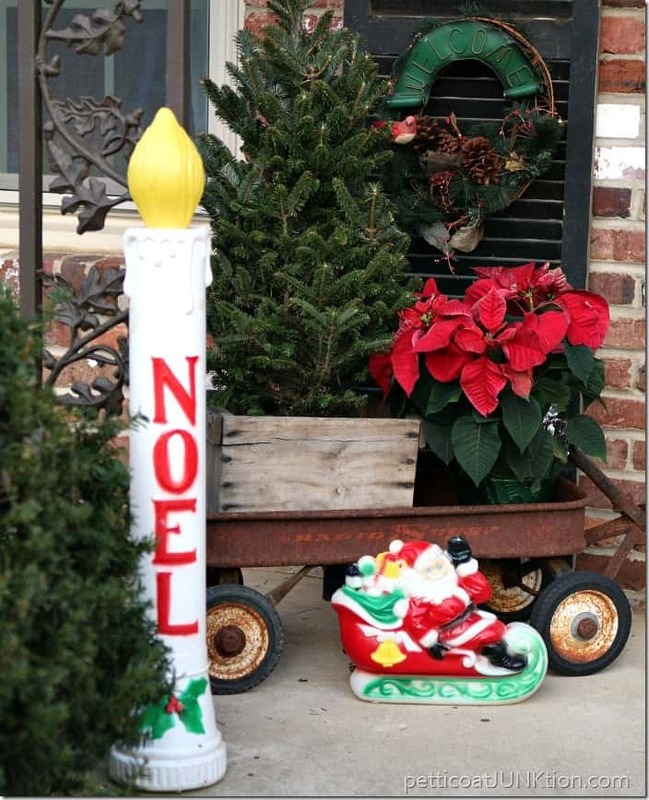 The red poinsettia on the right is sitting on a Christmas puzzle container I purchased many years ago. I needed to stagger the height of the poinsettias and the tin was the perfect color and size. 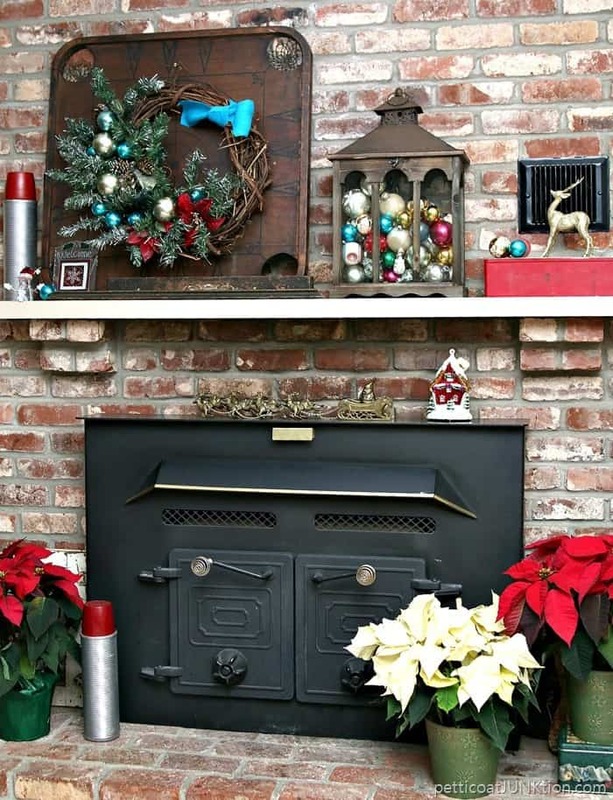 The brick on our fireplace is really busy looking and I try to add plain backdrops for wreaths when decorating the mantel. The vintage game board was perfect for this. I also added a couple of decorative wood molding pieces at the base of the game board. Again, just adding depth and character. 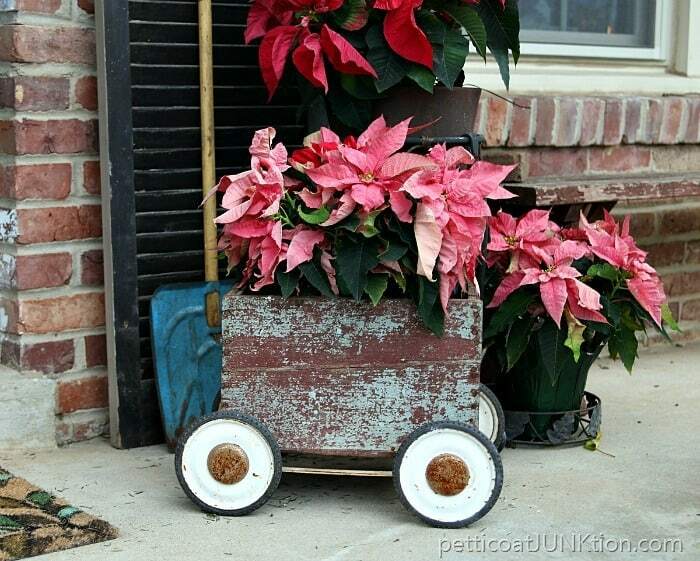 Add a blue snow shovel to your front porch decor along with a used crate or wood box to hold your Winter plants. I bought the wheels on a frame at my favorite junk shop many, many years ago. I’ve set all kinds of wood boxes and trays on these wheels. They’ve been around! 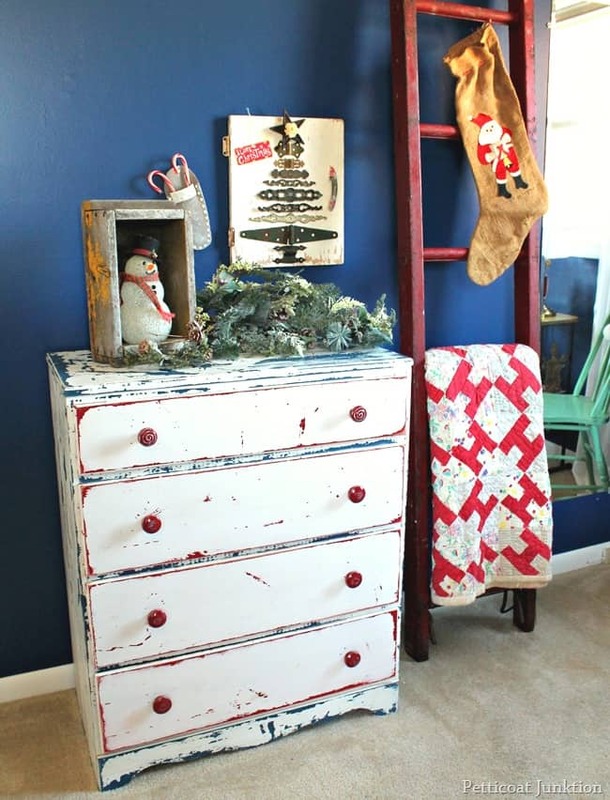 Old painted shutters come in handy as backdrops for favorite decor finds. This photo is from Christmas 2014. Notice a different wood box sitting on the wheels and a different color shutter. The tree I used in this display was shorter than I liked so the rusty wagon was put to use along with the wood box to add height. The rusty wagon has been filled with Summer plants the past two Summers. Amber bottles make pretty vases or they’re just pretty by themselves. 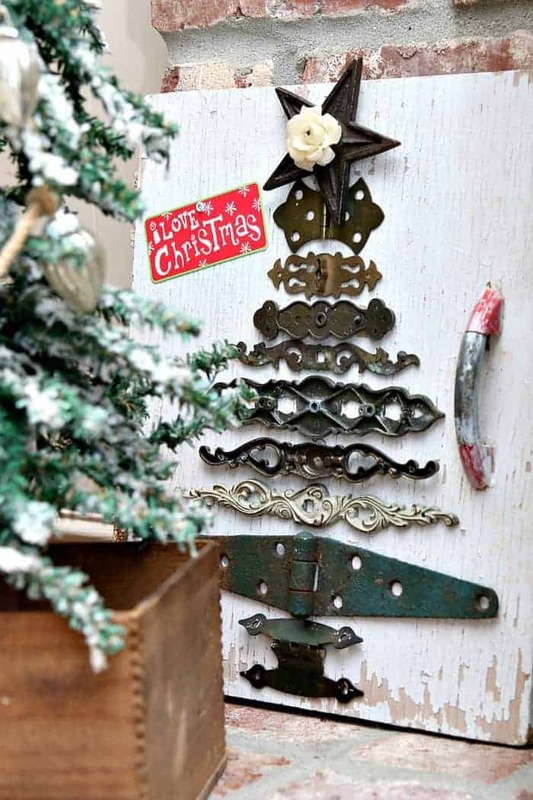 Anyone use vintage bed springs to hold Christmas ornaments or artificial flowers…..or something else. You might notice the amber lamp base also. I purchased a pair of white china cabinet doors with etched glass at the Nashville Flea Market a few years ago. They are taking up space on a china hutch right now. My Christmas mantel in 2013 featured vintage glass lamps as ornament holders. I’ve used the vintage lamps to hold birdhouses and other decorative items. I also raided the china cabinet for cut glass creamers. 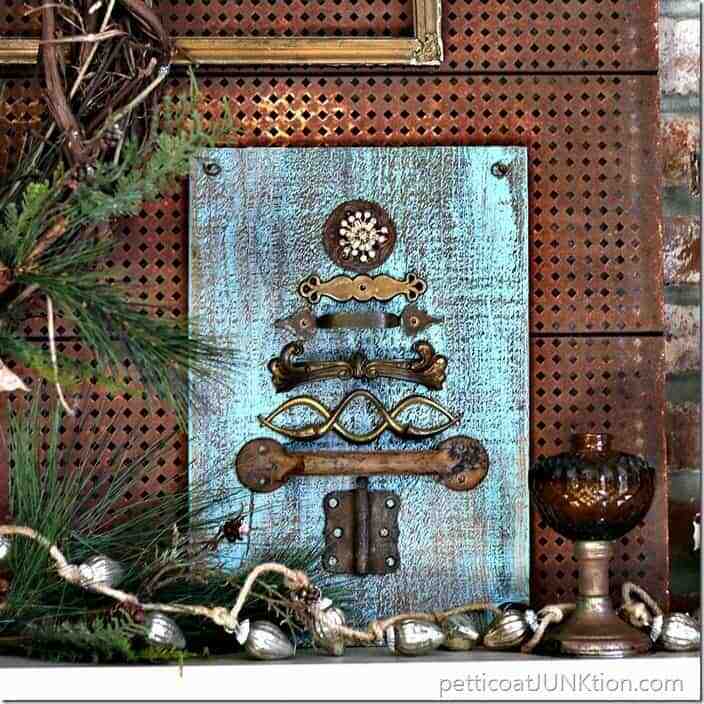 The wreath is hanging on a large rusty metal piece I found at the Nashville Flea Market. It’s one of those backdrop things I was talking about for on the mantel. Vintage kitchen scales are ideal for showcasing treasures of all kinds. This is my Christmas porch decor from last year and it’s one of my favs. 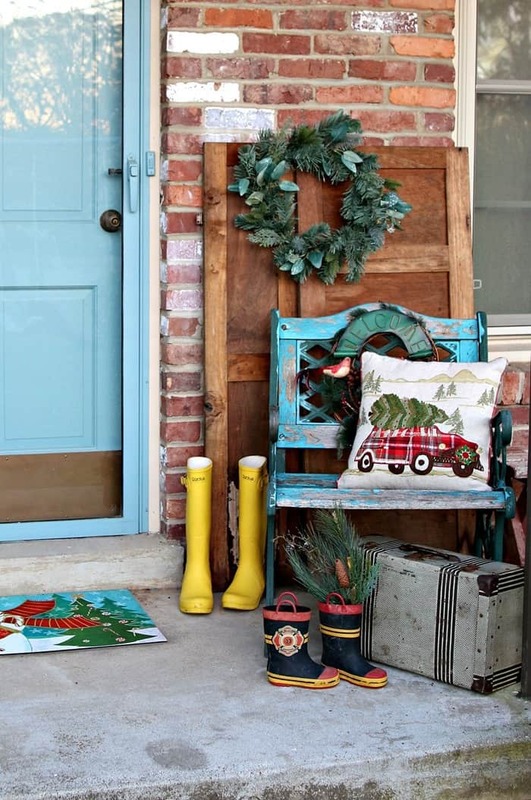 I love the boots and the vintage metal suitcase and the chippy wood lawn chair and the recycled wood! Wish I still had that red ladder. I often keep things for a while then take them to my booth to sell. I can’t keep everything I buy so I have to rotate items. The ladder made a great quilt display. I particularly like the handmade red quilt hanging from the ladder. The candy cane holder is part of a leather tool belt I spray painted white. The chippy yellow box holding the snowman is a favorite find I no longer have. My sweet daughter bought the stained glass window for me when we lived in Florida. I keep it out year round. The colors and design are perfect for a Christmas display. I change out the votive in the black candle holder to fit the seasons. The black box with handle is an antique sewing box. I sometimes add a large red bow to the handle for the Christmas season. The checker Christmas tree is one of my fun junky creations. 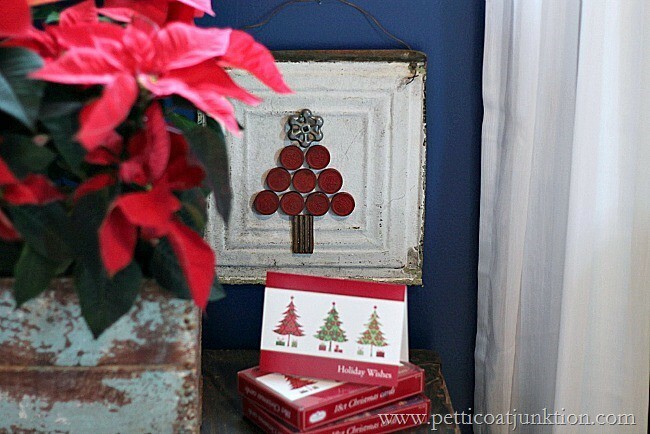 The tree is made up of red checkers, a small piece of reclaimed wood molding, and a silver garden spigot on a reclaimed metal roofing tile. 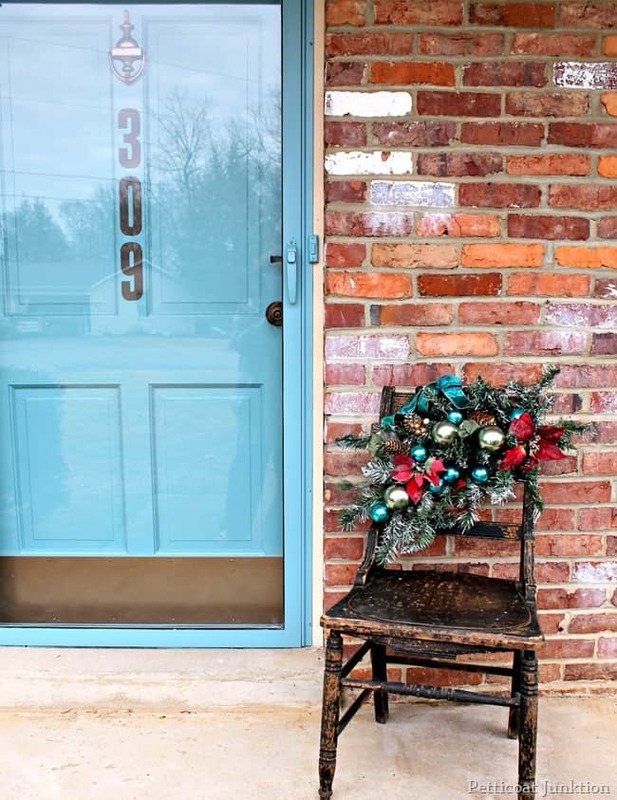 Old wooden chairs are fun to use as wreath holders or plant stands. I ended up selling this chair. I sure miss it. 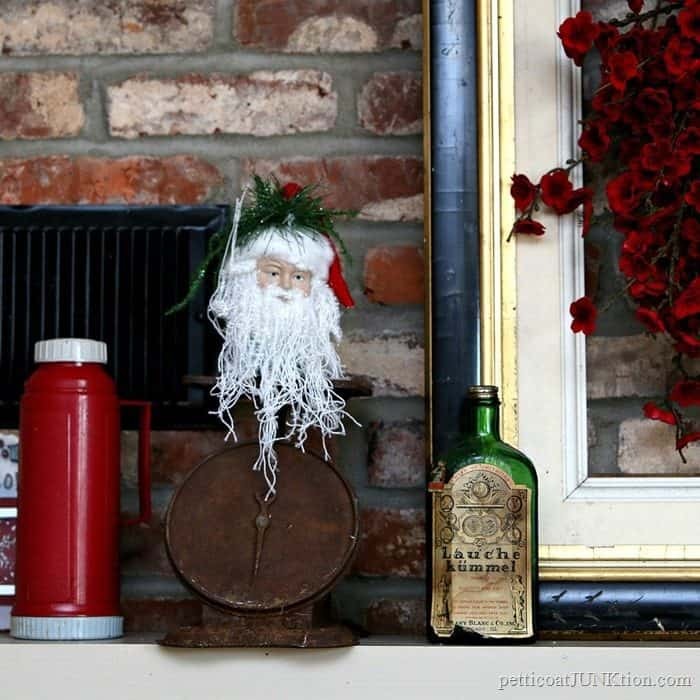 Here I’ve used another thermos, rusty rusty scale, an antique medicine bottle and an extra large antique picture frame on the mantel. You really just need a nice mix of old and new stuff. I called this mantle my rust and red theme. 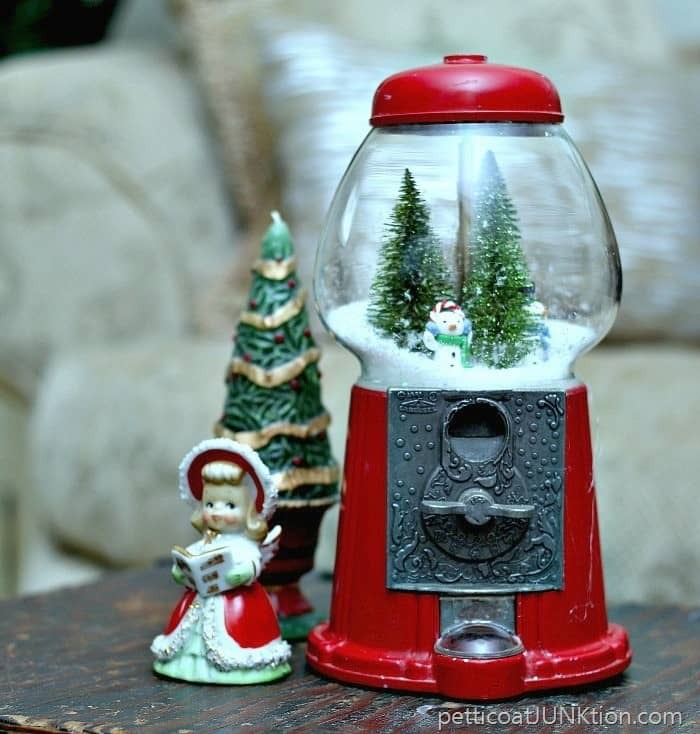 I had fun turning the gum ball machine into a Winter wonderland snow scene. Bluster the Christmas Snowman was a craft from the past. Man, I was cooking back in 2013 when a lot of these projects happened! Where did all that energy go. I almost forgot about Bluster. He’s really cute! Hey, here’s another snowman and I made him in 2012! The Hardware Christmas Tree from 2012 is still around. I used glue to adhere the hinges and other hardware. We store our Christmas stuff in the top of the shed and it gets really hot up there. The tree seems to make it year after year! I took this photo of the tree last year. When I put the tree together it took a while to find and place the pieces just so so. I was really happy with how it came together. The topper is my favorite part. It is an iron nail star with a reclaimed piece of jewelry in the center. This is the 2015 edition of the hardware Christmas tree. I call it the Sparkle and Rust Christmas tree. It’s on the Christmas mantel this year. Do you save your Christmas cards year after year? Sometimes I do but most of the time I toss them. I found a few vintage Christmas cards at the local flea market a while ago and fell in love with them. I never found a use for them until now. 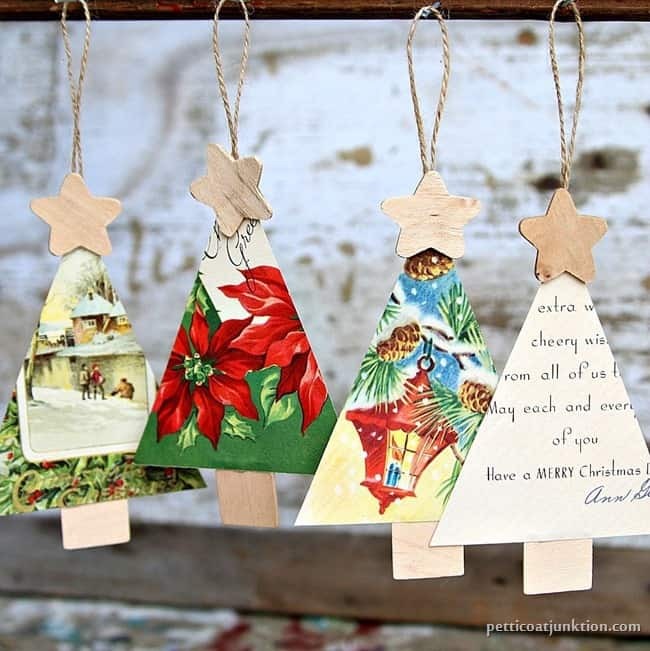 They make cute Christmas ornaments and the craft project is perfect for kids. Super simple. I used most of the vintage cards making Christmas ornaments so I searched eBay for cards to add to my stash. 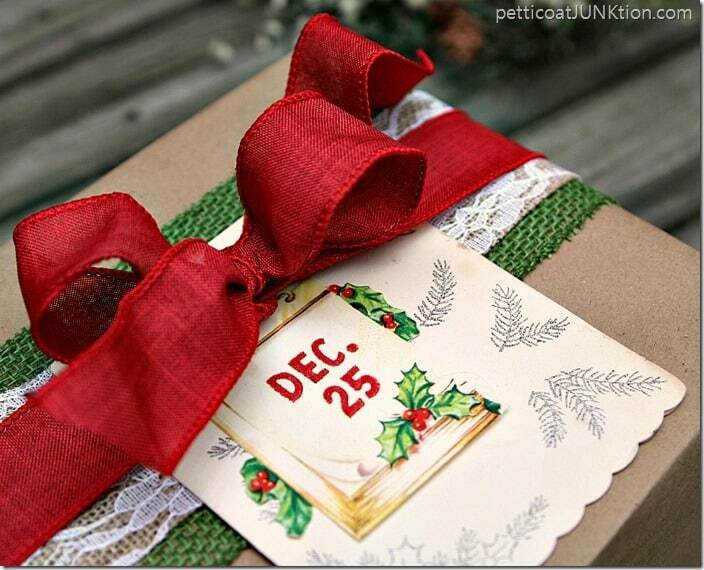 This is a package I wrapped with brown Kraft Paper and decorated with one of the vintage cards from eBay. 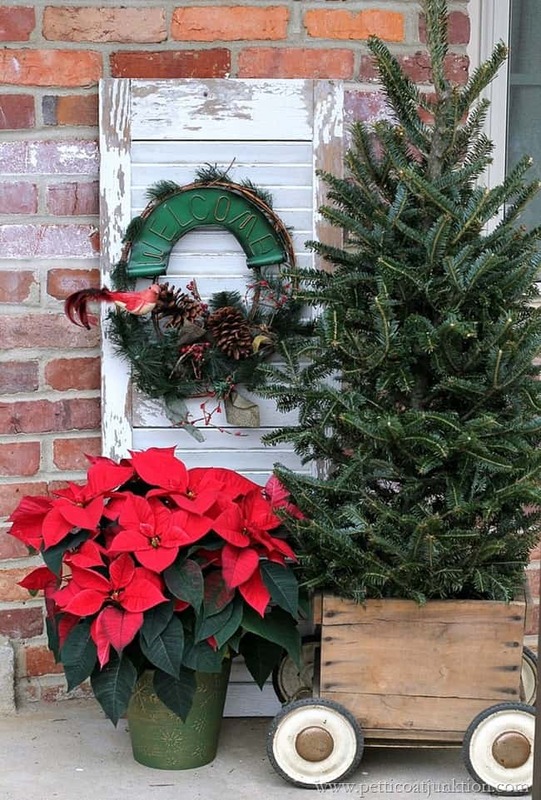 It went perfectly with the green, burlap, and red ribbons. You should see the cute Teacup Christmas Ornaments I made! I filmed a video of the process. See it below…. Which idea did you like the best? 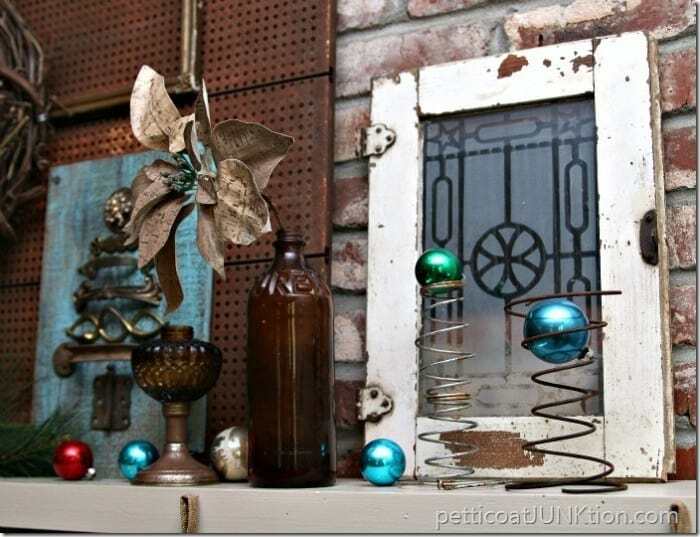 Do you recycle or use reclaimed items in displays? How about multipurpose items…..have any of those? Love the creativity that comes from your house to mine! Can you come to my house and decorate? I love all your creations……….so inspired!! 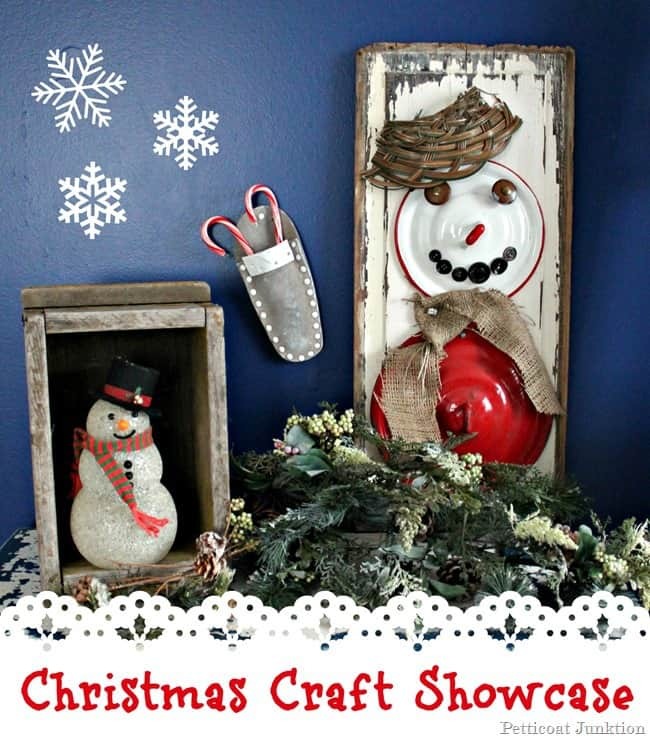 Of course I love the pot lid snowmen and the hardware Christmas trees. Wishing you and your family a joyful Christmas season. I love the joy that comes from the process of making and creating all your ideas and crafts. I love the hardware Christmas trees. So many cute ideas! Love the wagon! 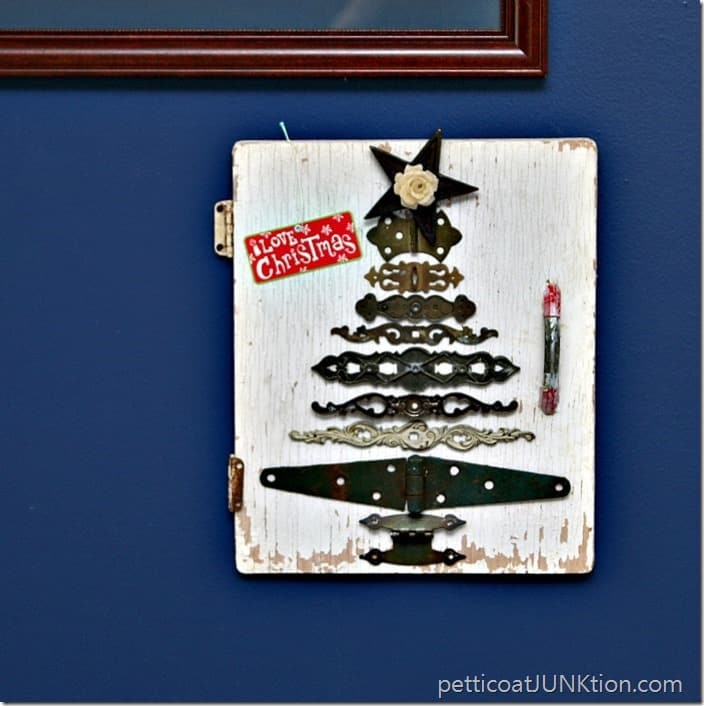 Love all your up-cycled Christmas decor! Love the candle blow mold. 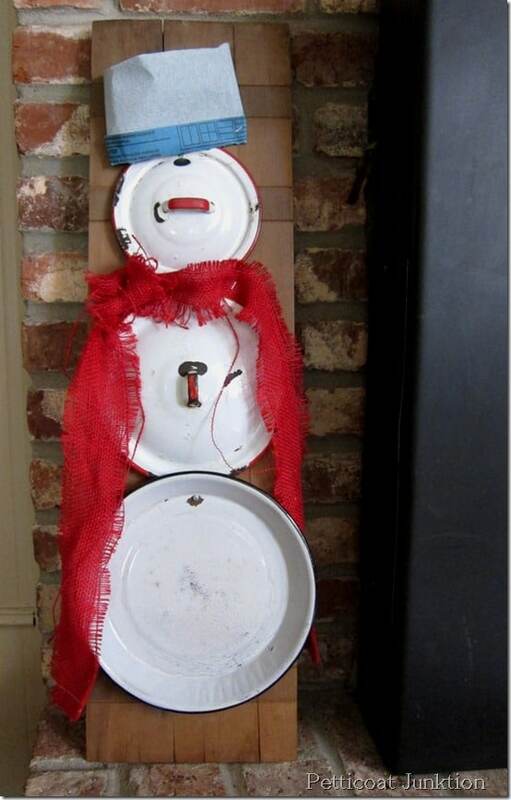 I adore all your snowmen – especially the ones made from pot lids. 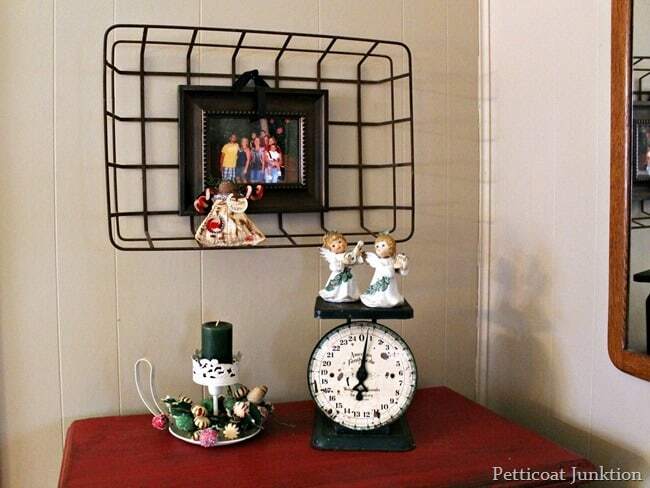 How clever, thrifty, and green! Thanks for sharing. My best wishes to you and yours for a wonderful holiday! Love the snowman makeovers using lids! So unique! !